Basically what’s happening here is that the FCC is attempting to dismantle rules and regulations that would otherwise prevent broadband and telecom companies from having the power to shape the online experiences of every single American. This doesn’t just mean you get charged for access to the internet, it means that companies like AT&T, Verizon, Comcast, and others can parcel up and surcharge PARTS of the internet you like, and sell them to you at a premium. Do you love Snapchat, Facebook, and Twitter? You’ll love Verizon’s new “Social Plus” package, only an extra $30 a month! Are you a digital content creator!? Well, you won’t want to miss out on Comcast’s new “Digital Entrepreneur” Bundle – only $29.99 a month (for 12 months, exclusions apply)! Obviously neither of those things are real, but with the FCC’s actions today, they very well could be in the near future. Current regulations also prohibit ISPs from blocking websites, charging for higher-quality service, or parceling off certain content. If their plan succeeds, have fun trying to use Google’s search engine if you’re a Verizon (owners of Yahoo) internet subscriber! 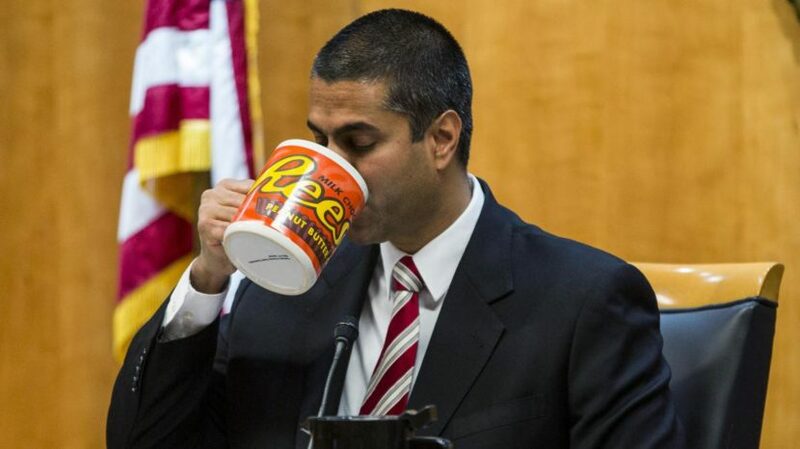 Ajit Pai, FCC chairman and no-lineup having, swaggerless, “my Dad works at Nintendo” looking headass, claims the rollback of Net Neutrality would “help consumers” and “promote competition”, but what he really means is “lmaooooooooooooo open those wallets if you wanna use the internet the same way suckers!”.